Catch A Glimpse (City Zip) wins the Appalachian (G3) at Keeneland on 4.14.2016. 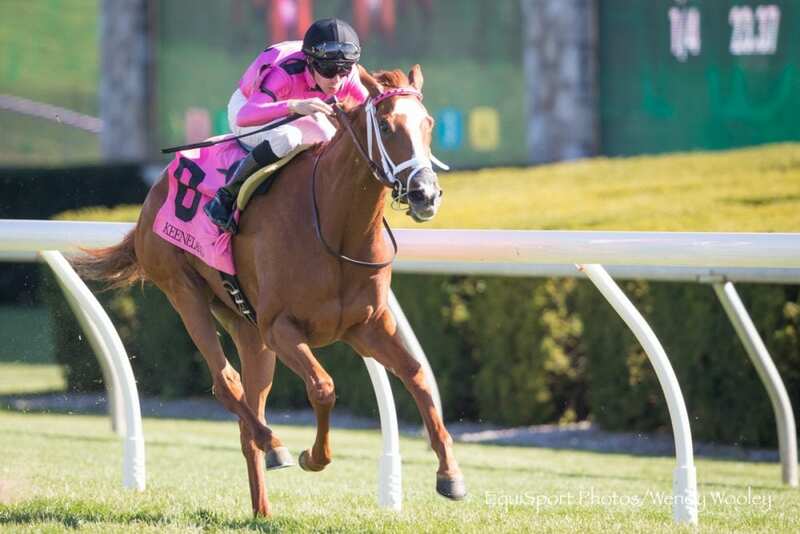 Catch a Glimpse improved her record to five for six Thursday afternoon when she prevailed by 3/4 of a length over rival Ava's Kitten in the stretch of the Grade 3 Appalachian Stakes at Keeneland. Under the guidance of Florent Geroux, the filly stalked the early pace before swinging three wide in the final turn and drawing clear in the stretch. The race is the second outing for the Mark Casse trainee following her win in the Grade 1 Breeders' Cup Juvenile Fillies Turf–she also won the Grade 3 Herecomesthebride at Gulfstream Park in February. Gary Barber, Michael Ambler, and Windways Farm own the 3-year-old City Zip daughter. Catch a Glimpse was bred in Kentucky by Branch Equine, LLC and is out of Irish River (FR) mare Halo River. She was a $75,000 purchase at the Keeneland September Yearling Sale in 2014, where she was purchased by Warrendale Sales from consignor Windways Farm. After basing at Woodbine for two of her career starts, Catch a Glimpse was awarded three 2015 Sovereign Awards, including Horse of the Year. The final time for the mile on the turf was 1:37.27. See the full chart here. “Everything worked out good. Looked like on paper there was a couple of horses with speed right inside me, so I had nothing to worry about. Everything went good. She relaxed very good down the backside. When I asked her to go, she gave me a very nice turn of foot. “Sometimes at the end (of a race), she gets a little bit bored. She does it so easily that sometimes she switches back and forth – left lead, right lead – but I think it's just because she's not really paying attention because no one is really challenging her. This entry was posted in Racing and tagged Appalachian Stakes, catch a glimpse, Florent Geroux, Horse Racing, Keeneland, Mark Casse, Paulick Report, thoroughbred by Paulick Report Staff. Bookmark the permalink.